No, that's not a typo. 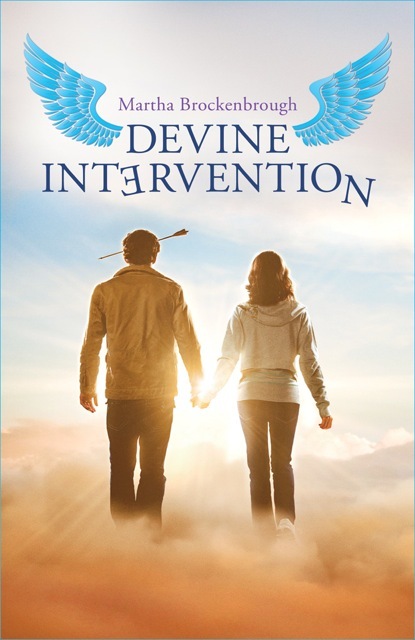 It really says "DEVINE" Intervention. Just ask Martha Brockenbrough, the queen of grammar. She's the founder of National Grammar Day and SPOGG (The Society for the Promotion of Good Grammar) and the author of Things That Make Us (Sic). And now she's making her young adult debut with Devine Intervention, about a girl named Heidi Devine and her guardian angel. Synopsis (from Indiebound): There is a great legend of the guardian angel who traveled across time and space for the human girl he loved, slaying those who would threaten her with a gleaming sword made of heavenly light. Why I liked it: One of the funniest and at the same time most touching YA novels I've come across in a long time. Laugh-out-loud moments combined with truly heart-wrenching moments make this one unforgettable experience. Honestly, this is one of those books you wish wouldn't have to end because you're having so much fun reading it. Jerome is just plain goofy and yet endearing and sweet in his own way. And yes, he has an arrow stuck in his head, he doesn't know what "discourse" means, and he's found a way to get around the rule of no swearing in heaven by substituting words like Chevy and flask. Heidi is serious and shy and isn't ready to die. She's just been through a humiliating experience at the school talent show, and anyone who's ever survived high school knows what that's like. Heidi and Jerome could easily become heaven's odd couple -- but the author surprises you with an unexpected turn of events. Or several. And since I enjoyed the heck out of this novel, I want to give away my arc, so someone else out there can enjoy it too, before the book pubs in June. To enter, all you have to do is be a follower and comment on this post. United States entries only (sorry!). You must be at least 12 years old to enter. This giveaway ends at 10 pm EDT on Thursday, May 17. Winner to be announced on Friday May 18. Oh, the last great book I read came from you, so I am back! Hi Corey! Thanks for coming back! Ha ha. Sounds like a great one, Joanne! My favorite books are those that make me laugh and touch my heart at the same time. Thanks for word about this one, and I'd love a chance at the ARC! You're officially entered now, Barbara! A book that's funny and emotional? Sign me up. Sounds really refreshing. Hi Vivien! Refreshing is a good word for it. I just read something so beautiful but so sad (A Monster Calls). I need to read something funny. Oh, that one IS sad! You're right. You need to read this book. If you don't win, go out and buy a copy in June! I can't wait to read this - martha is a hoot.